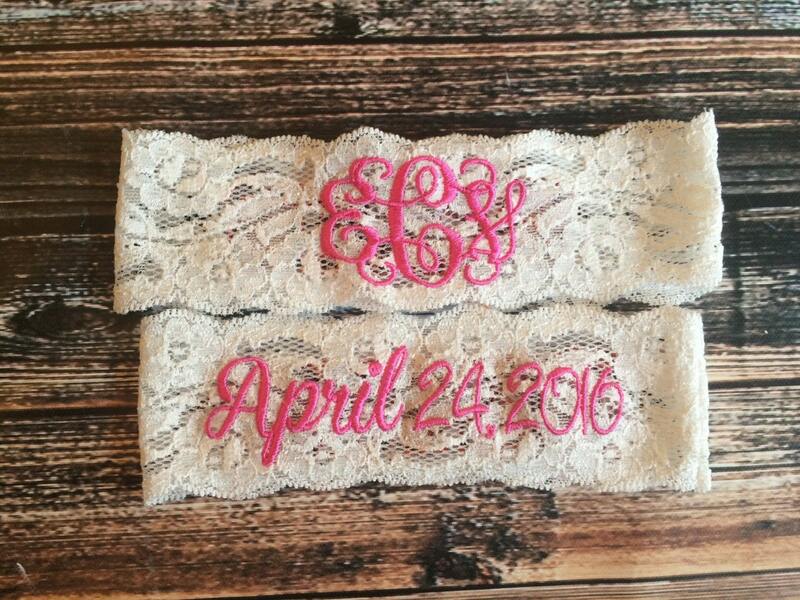 This listing of for one monogrammed keepsake garter with pink thread and a wedding date toss garter. WANT ANOTHER COLOR or CUSTOM EMBROIDERY? JUST ASK! *PLEASE copy and paste Initials to be monogrammed in the order you would like them to appear to the note to seller section and make sure you DOUBLE CHECK as there are no returns on custom or wedding items. **Custom garters or any other monogrammed items can not be refunded after 48 hrs of purchase date due to the nature of this item. 3) THIGH MEASUREMENT- How to Video is located on our "About this shop". -Pull the tape measure or string snug (but not too tight) and DO NOT TAKE OFF any inches. I know exactly how much to remove to ensure a proper fit.